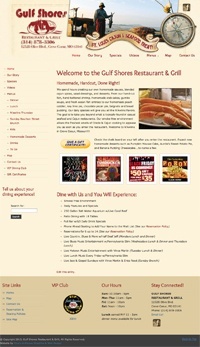 Gulf Shores Restaurant & Grill is a Cajun Seafood restaurant in Creve Coeur, MO. This website includes multiple menus, animated ads, and a sliding thumbnail banner on the front page that advertises their daily specials throughout the week. Website visitors can use the online form to join their VIP Club.